NEW YORK – March 29, 2019– Seabury Maritime LLC (“Seabury Maritime”), the global maritime and transportation investment & merchant banking and industry advisory firm, a division of Seabury Capital Group LLC, today announced its new collaboration with Norway-based BASS Software (“BASS”), the world’s leading provider of fleet management solutions for the maritime industry. 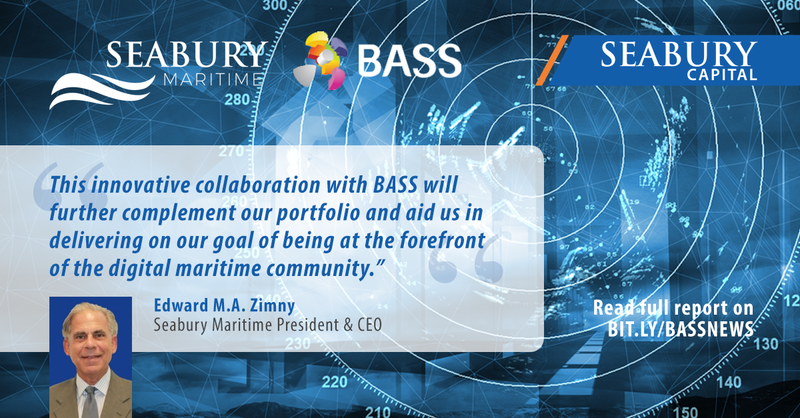 As part of the agreement, Seabury Maritime will be providing strategic advice and business development services to BASS, which are aimed to enhance the company’s continuous commitment to growth and close customer support in key markets across the globe, including this new strategic focus on North America. Seabury Maritime has established itself as the premier ‘go-to’ provider of end-to-end solutions for maritime-oriented transportation investment banking and consultancy needs. BASS is a market leader in integrated ERP solutions for shipping and offshore. The company has deployed its BASSnet™ fleet management platform with more than 100 customers globally, including many leading shipping companies and offshore service providers. “As we continue to grow our customer-base worldwide, we find significant interest in the North American region for our state-of-the-art and modular-based ERP solution, BASSnet™ Fleet Management Systems. Our industry-proven systems are augmented and enriched with seamless and progressive web and mobile apps,” noted Per Steinar Upsaker, CEO and Managing Director of BASS. “We firmly believe ship owners and managers will find BASSnet™ to be the complete, integrated and future-proof answer they have been looking for to elevate their business to the next level. With their deep expertise and established network in the North American market, we are confident Seabury Maritime is the ideal long-term partner to considerably raise our profile and market-share in line with our global expansion,” added Upsaker. BASS, founded in 1997 with Norwegian heritage, is a leading global provider of fleet management software for ship owners and ship managers, as well as operators of rigs and floating production, storage and offloading vessels (FPSOs), and offshore units. More than 100 customers, including many of the world’s leading shipping companies and offshore service providers, run fully-integrated BASSnet™ Fleet Management Systems on more than 2,000 vessels around the world in order to manage their physical assets, operational processes and human resources, ensure regulatory compliance and improve financial results. For more information, please email contact@bassnet.no or visit www.bassnet.no. Seabury Maritime is focused on global trade and transportation. Our team has developed a thorough understanding of the underlying competitive economics that drive strategic investments and decision-making, while assisting companies operationally to adapt for success and maintain sustained competitive advantages. Reference Seabury Maritime at www.seaburymaritime.com. Since its founding in 1995, Seabury Capital has taken ownership stakes in software and asset management businesses servicing the aviation and travel industries. Within the last few years, Seabury Capital has expanded its portfolio by investing in early stage startup companies within the financial technology industry and structured investment products. In addition, Seabury Capital owns and operates FINRA and FCA regulated investment banking services firms in the U.S. and U.K., respectively, serving external clients as well as assisting the companies in which Seabury Capital has invested. Seabury Capital has operations in New York, Amsterdam, Berlin, Chicago, Cordoba, Dallas, Dublin, Durban, Edison (NJ), Hong Kong, Houston, Jersey City, London, Los Angeles, Manila, Minneapolis, Singapore, Summit (NJ), Stamford (CT), and Tokyo. Reference Seabury Capital at www.seaburycapital.com.